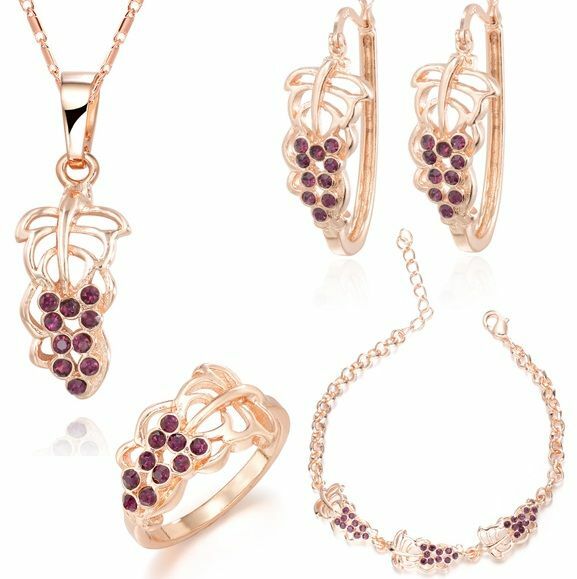 The Vine leaf & Grapes shaped Set is a perfect jewelry set for special occasions. Made of alloy with gold plating and good quality rhinestones giving it a very sparkly and elegant look. This set has hoop earrings with embedded rhinestones. The set also has a perfect matching Ring & Bracelet. The earrings and pendant rhinestones are arranged in the form of Vine Leaf & Grapes. Ideal for gifts to loved ones. A beautifully designed jewelry box / pouch is included for an impressive gift presentation.